Horses that have not been halter broken are virtually impossible to handle or do anything with. The halter is a basic piece of equipment which is placed on the horse's head and used to tie the horse, lead the horse and convey basic commands to the horse. Halter breaking is the first step in training a horse. In an ideal situation, a foal should be handled by humans almost immediately after his birth. It is considered normal to place a halter on a foal within the first few days of his life in order to get the foal used to the feeling of wearing a halter on his head. The benefit of halter breaking a foal is that he has not developed any bad habits yet and his small size makes him relatively easy to handle. If you can get your foal used to having his head handled and a halter taken on and off regularly while he is still very young, he will likely always accept the halter as a simple and unquestioned part of his daily life and routine. When halter breaking a foal it is important to make sure that the halter fits appropriately and is not loose enough to get snagged on anything. When horses are born in the pasture or left unhandled for the first part of their lives it can make it slightly more difficult to halter break them. Halter breaking an adult horse involves patience and time. You will have to spend time getting the horse used to your handling his head, ears and neck. Reward the horse for letting you touch him by offering him treats and verbal praise. Once the horse accepts your touch, you will begin getting him used to the halter. You will have to introduce the halter slowly and let your horse get used to the smell and sight of it in your hands. When you are ready to try to put the halter on the horse, you will need to gently slide it over his nose and up onto his head, buckling it on the side of the head behind the ears. It may take multiple tries to get the halter onto an adult horse, but you should not be discouraged. Once the halter is on, you will probably want to leave it on for several days so that the horse accepts wearing it before you begin practicing taking it on and off. It is important never to get angry with a horse when you are trying to halter break it. You should not scream at the horse, hit him, throw the halter or behave in any type of aggressive manner towards the horse. You do not want the horse to view haltering as a scary process. You should also never give up when working with your horse. It is important to end each lesson with some kind of success, even if it is just that you got the halter over the horse's nose without him trying to escape. End every training session on a positive note for both yourself and the horse. Once you have the halter on your horse's head, you need to teach him to respond to pressure being applied on the halter. 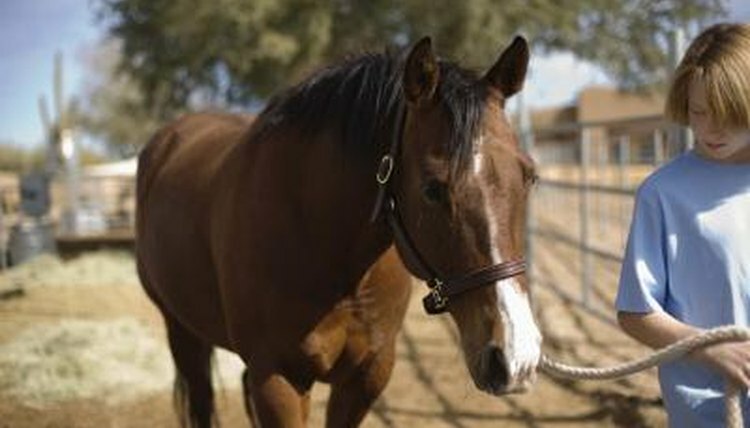 Start by attaching a lead rope to your horse's halter. Stand to the right of the horse and apply pressure by pulling the lead rope to the right. Your horse should turn his head towards you. When he does, praise him. Now do the same thing to the left. Teach your horse to step forward and backwards by applying pressure to the halter and releasing it when he moves the direction you are asking him to move. Your horse will soon figure out to follow the pressure of the leadrope as a way to release the pressure that is being applied. You can reward your horse with treats and praise for behaving correctly.